Urkontinent, you’re saying? It’s a German word for the theory that all the continents were once connected. And Dogfish Head (Milton, Delaware) made this beer a giant social collaboration that spanned five of the seven continents. Yes, it’s the worlds first and (so far) only beer that contains Google honey. Take that, White House Honey Ale! 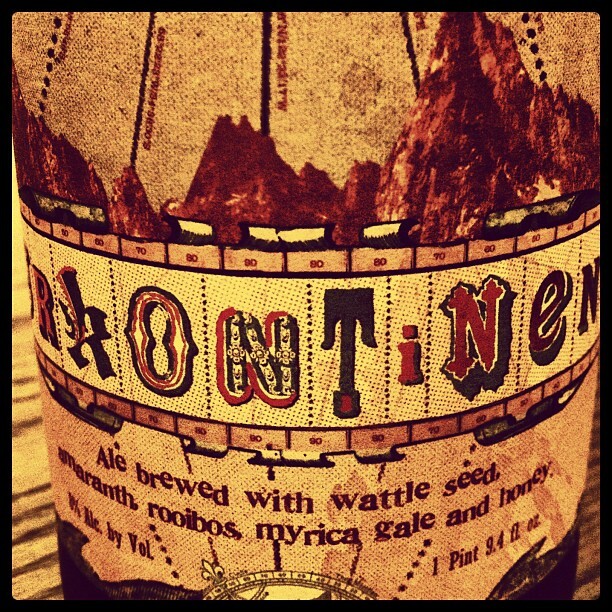 Alright, so Dogfish is known for taking strange ingredients and adding them to their brews. Honestly, I had to look up every single ingredient involved in this beer with the exception of the honey. Urkontinent is brewed to 8% ABV (alcohol by volume) and just 12 IBUs (International Bitterness Units), so I’m expecting a sweet beer. We’ll see if all these strange ingredients work together. Sometimes these extreme Dogfish beers don’t work out. Urkontinent poured a large creamy and soapy head, off-white in color and lasting. 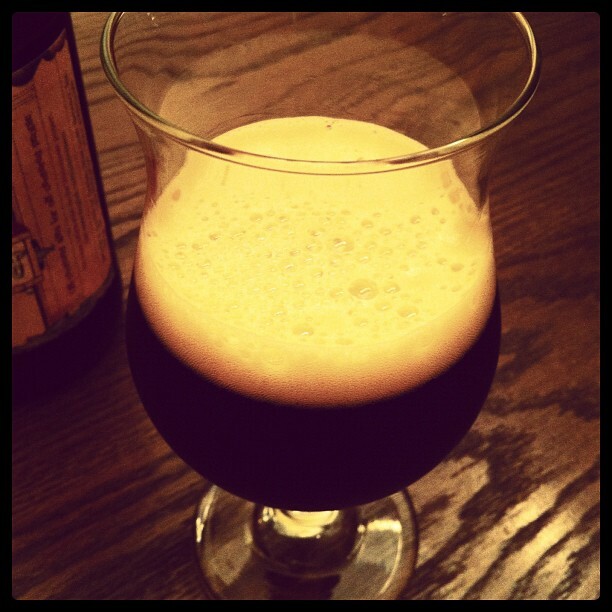 The beer was a deep ruby-brown color, clear in body, free of particles and sediment. It was slightly translucent, and even moreso when the chill haze wore off. There was no lacing. This is one strange beer to describe the aromatics of; up front, it is quite medicinal, with some lingering milk chocolate notes. It’s sweet at the same time, providing a bit of dark fruit (fig) and a tiny amount of floral hop. There’s some sourness, too; like a sour cherry. I did not find this aroma to be pleasant, and if you’re looking for something that smells remotely like beer, this is not it. On the taste, let the oddity continue: there’s grain at the start, and it’s bitter grain — then there’s some watery chocolate, a sour grape note, and a finish of sweet dark fruit. 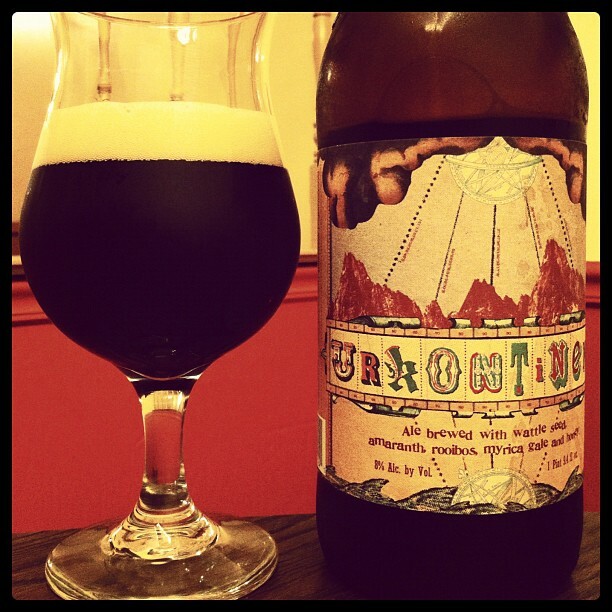 Urkontinent was quite earthy tasting, with a thin and foamy mouthfeel. And with the 8% ABV, there’s an alcohol warmth here. I’m going to be brutally honest: this is not a good beer. In fact, I barely call this drinkable. I’m 99% sure this is not an infected beer, but it sure smelled like it and nearly tasted the same. I did notice that as it warmed, it got a touch better, with more of the chocolate notes coming out, and the sourness taming. I cannot recommend this beer, and in my opinion, this is a perfect example of Dogfish experimentation gone horribly wrong. Google should stick to searching and Dogfish…well, I’m not sure what advice to give these guys. Maybe their biggest challenge would be to make a great Lager or Pale Ale? 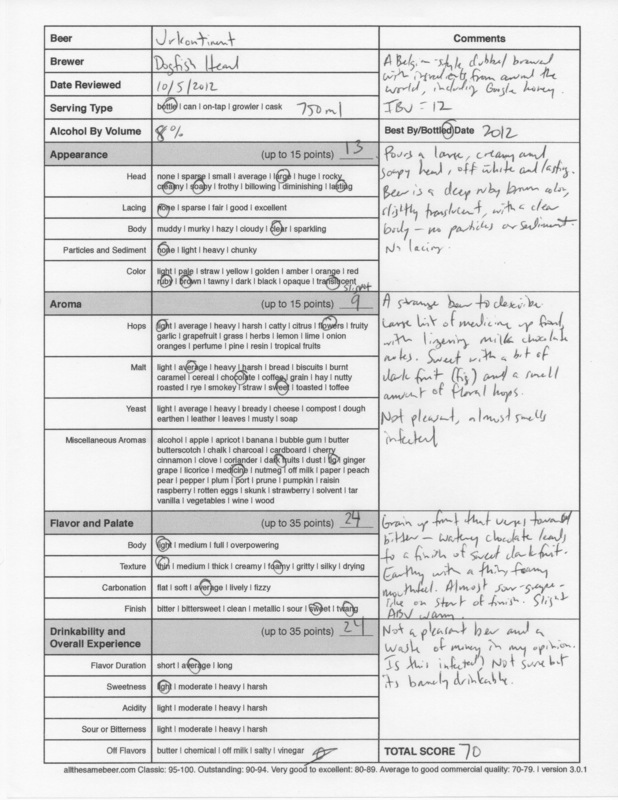 Dogfish Head Urkontinent, 70 points. Price: $12.99 US for one 750 ml bottle.